Fresh Pumpkin Pie (NO cans!) | Have YOU Ben Starr Struck? Of course, the best one involves nothing from a can, which means WORK. I’ll throw you some shortcuts the deeper we get into the recipe, but if you want to make pumpkin pie the way my grandmothers and great grandmothers made it, this is how it’s done. You’ve got two choices here, oil crust and butter pastry. Oil crust is fast and healthy. It’s also pretty much foolproof. It’s flaky and good. Butter pastry is more traditional, it’s more fattening, it tastes better on your tongue because of the butter, but it’s not quite as flaky as oil crust. It takes longer and has a higher risk for failure. You decide which one to use. This is the recipe my mother has used for the past decade, and it’s brilliant. Stir the ingredients around with a fork until all the dry ingredients are wet. If you still have flour in the bottom of the bowl, add a splash more milk and stir another few strokes. Push the dough ball down into a disk with your palm, then place another piece of wax paper on top of the dough. With a rolling pin, roll the dough out to about 2 inches wider than your deepest pie plate. Remove the top layer of wax paper and set the pie plate upside down onto the dough. Then slide your hand under the bottom layer of wax paper and flip the pie plate and dough over. Gently set the crust down into the pie plate and remove the wax paper. Flute the edges of the crust with your fingers. First tuck under any excess crust to form an even lip all around the pie plate. Then push your index finger of your left hand between the index finger and thumb of your right hand to form flutes, as you see here. Then put the crust in the fridge until it’s time to bake. You’ll speed up your process by slicing the butter into “pats” before adding it to the flour. 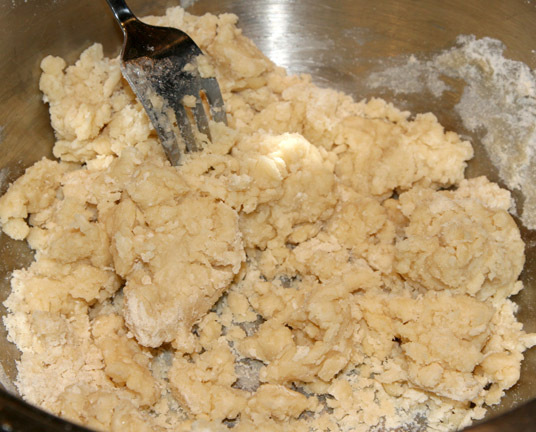 Using a pastry blender or your fingers, work the butter into the flour until the whole thing resembles course crumbs. Start with 4 Tablespoons and stir everything around with a fork. You’re wanting the crumbs to come together into a dough that’s not too dry, nor too sticky. Add another Tablespoon if the dough isn’t moist enough. Maybe you’ll need to add two, depending on the outside humidity. Perhaps even a little more. Once the dough holds together, it’s ready. If you add too much water and the dough is sticky, it’s not ruined. Just use some flour to dust your hands and the top and sides of the dough in the next step. You can also make this crust entirely in your food processor. Just process the butter into the flour, then blend in short pulses as you add the water until the dough is ready. I’ve found my crusts end up tougher when I make them with the food processor. In the bowl, do a very light kneading by flouring your hands and turning and pressing the dough about six times, just to help bring it together. Then remove the dough, form it into a ball quickly in your hands, and place it on a piece of plastic wrap or wax paper. Wrap the dough up and put it in the fridge to rest for 30 minutes, or into the freezer if it’s a hot day. Don’t skip the chilling step. It’s really important for making sure you have a tender final crust. You want all the butter particles to stay solid until the very moment the pie begins to bake. After the dough is chilled and rested, remove it from the fridge. Roll it out and plate it using the method in the recipe above. If you need to bake this crust before adding filling, use the same baking method listed in the recipe above for Mom’s oil crust. This is how to make pumpkin puree from scratch, instead of using canned pumpkin. It’s not really too hard. Take a pumpkin, preferably the small “sugar pumpkin” or “pie pumpkin” variety, but any one will do, and cut it in half. If you want to save the seeds, scoop out the seeds and stringy bits. But you can save time by leaving them in the pumpkin. It will be easier to scoop them out after the pumpkin is cooked. There are two options for cooking: roasting/baking or microwaving. To bake, place the pumpkin, cut side down, in a rimmed baking pan. Fill the pan with about 1/2 cup of water. Then bake in a 350F oven until the pumpkin is soft when you press on it with a wooden spoon. This can take anywhere from 30 minutes for a small sugar pumpkin to 90 minutes or longer for a big pumpkin. Remove the pumpkin from the oven and let it cool. For the microwave, place the pumpkin, cut side down, on a plate and microwave on high for 20 minutes or longer until the pumpkin is soft. You may have to do this a half at a time, depending on the size of both the pumpkin and your microwave. The pumpkin will release a LOT of water, which may cause steam to condense behind the timer display. It will eventually evaporate…no worries. But you may end up with pumpkin juice all inside your microwave and have to clean it. I DO use this method when I’m in a hurry. Let the pumpkin fully cool. If you left the seeds and strings inside, scrape them out and discard them. Then scrape out the flesh with a spoon, put it in your blender or food processor, and process until it’s smooth. Whisk all this together until smooth. Pour the filling into an unbaked crust and bake on the center rack of a 425F oven for 15 minutes. Then, without opening the oven door, lower the heat to 350 and continue baking for 40 minutes. If the crust begins to brown too much, you can open the oven and place crust protectors over the crust. If you don’t have these (I don’t) then simply cut a square of foil a little larger than the pie plate, and cut out a large circle in the center. This hole lets the heat get through to the filling to bake it, but keeps the crust from getting too brown. After 40 minutes, test the pie by sticking a knife into the center. If the knife comes out clean, or with a few particles on it, the pie is done. If the knife comes out with wet streaks on it, it needs an additional 8-10 minutes before you test again. Let the pie cool completely on a cooling rack before serving. I think this pie tastes better after sitting overnight in the fridge, but let it warm to room temperature before serving. This entry was posted in Desserts, Recipes, Vegetarian and tagged buttermilk, Christmas, fresh, Halloween, homemade, no cans, oil crust, pie, pumpkin, scratch, Thanksgiving, vegan, whole. Bookmark the permalink. It is almost that time of year again. 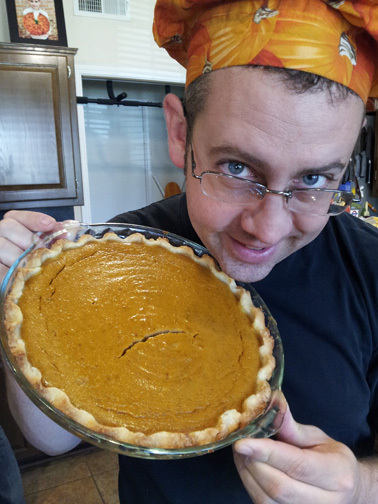 Since 2012 I have been making your pie recipe multiple times a year. With only slight differences I have not varied far from your original recipe. Thank you again for making such a wonderful recipe.